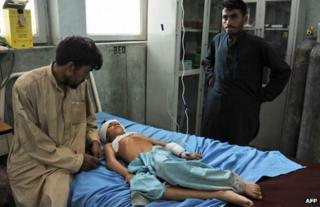 A bomb has killed 12 women and two children in a cemetery in Afghanistan's eastern province of Nangarhar. They were visiting the grave of a wife of a pro-government tribal leader during the Muslim holiday of Eid al-Fitr, when the device went off. It appears that many of the victims were from the same family. At least three people were also injured. The graveside bombing is the latest in a series of attacks in the province on the border with Pakistan. It follows a massive blast at the Indian consulate in the provincial capital, Jalalabad, on Saturday. The latest attack occurred in Nangarhar's Ghanikhel district, according to Channel One TV, a private Afghan broadcaster. Ahmad Zia Abdulzai, the Nangarhar governor's spokesman, told AFP news agency that the bomb appeared to have been hidden near the grave. Among the injured was at least one child. Mr Abdulzai suggested the motive may have been personal enmity. No group said it had carried out the attack. Earlier, President Hamid Karzai used his Eid message to urge Taliban militants to lay down their weapons and stop killing innocent civilians. "Come and serve your soil and put down the weapon which the stranger has put on your shoulders and that you kill your people with," he said. "Put it down and serve your people."